Video Blog #10 - The final VLOG! We have just one more video blog for you! Here are some of our favorite pictures from our last two years, as well as a few last messages from us! Thanks for watching, reading, and encouraging us all through this crazy adventure! As we are closing up our service, I just thought the blog couldn't be complete without a nod to all the fantastic books that we read during our two years of service. We started keeping this list during PST, and just kept updating it as we read. Over the last two years, we had a lot of possibilities for reading, and we definitely took advantage of it! As I said in the earlier blog, everyone told us that we'd never read as much in our lives as we did during our service in the Peace Corps. This turned out to be absolutely true - Although we both liked reading before coming to Uganda, our reading took on totally new levels during our service. We read on buses, read while waiting for meetings to start, read before bed, read when the power was out and nothing was charged, read during trainings when most people were out partying, read with student book clubs, and, my favorite, read out loud to each other! We read aloud while we cooked for hours, did dishes for hours, and did our laundry by hand (for hours...). There was also an exceptionally long and uncomfortable bus ride (it involved food poisoning and a plastic bag...I won't go into more details than that!) during which I will always remember Ryan readin Agatha Christie's "And Then There Were None" out loud to me as I was so sick I cried and our bus driver tried desperately to obtain local remedies from the villagers we passed by....Oh, the adventures! All in all, we read a combined total of 140 books during our time in Uganda - well over a book a week! Of those, Ryan and I read aloud over 30 books to each other over those many hours of cooking, dishwashing, and laundry! We truly loved the slower paced lifestyle that allowed for so much immersion in the (mostly) great books we had the chance to read! If you're interested, here are some of our overall favorites (in no particular order)! Now that we're home, if we can maintain reading with even a fraction of the frequency we did while in Uganda, I'll be pleased. But, if life gets busy, as we know it will, at least we had these two years to not only experience our own great adventures, but immerse ourselves in the adventures of characters once upon a time as well! Even though we're at home, Uganda is never far from our mind! :-) Here's another video blog of some of our Peace Corps events from December. First, some clips from Camp GLOW (read more about the week of camp here)! Second, some clips from our wonderful VSLA shareout (which you can read about here!). Easily two of our favorite recent events in Uganda! Well it will be a much merrier Christmas for 13 Ugandans and their families this holiday season. As we have posted before Christmas is a huge season to splurge in Uganda, just like America. Therefore, it has been perfect timing that our VSLA (Village Savings and Loan Association) shared out all their money about a week ago. For many of them they likely have more money then they have ever had at any one time, so there will be lots of meat on the family table this Christmas. We started forming the VSLA last October and November. We just had a random idea to start this association, because we feel that these groups can be such a good thing for Uganda. They develop a savings culture that, while only in its infancy in Uganda, can lead to so many more doors being opened to ordinary citizens without the help of foreign aid or their government. Individuals can increase their likelihood to develop new business, send their children to better schools, or just help buy that extra nice pair of shoes. Now obviously savings is not necessarily something many Americans have mastered either, but at least we have additional avenues to make expensive purchases (Bank loans, credit cards, etc. ), which are generally not options in Uganda. 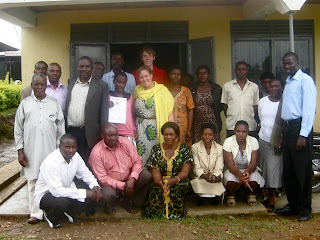 The VSLA we had the pleasure of forming with the employees and friends of the Bushenyi Honey Co-op was a great success. When all the books had been figured they mutually saved about 11.5 million shillings (or $4300), and they had interest off of loans totaling about 2.5 million shillings (almost $1000). The person with the most money saved had 1.65 million shillings (about $620). They were a stellar group all around, and we loved getting to see them flourish. They ended their cycle last Sunday with a big share out party. They used the remainder of their “Emergency Fund” to buy food and drinks for everyone there. Everyone got to invite one other family member to join in the festivities. They of course had many speeches, a photographer, a cake cutting, and lots of good food to celebrate the occasion. 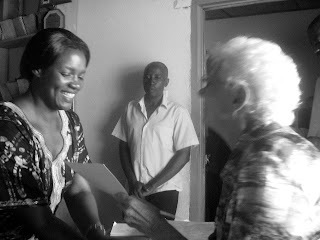 Each person came up with their family member to receive their check of their savings plus interest earned on each share. One of our good Peace Corps friends Marianne served as at the guest of honor (which entailed a lot more then any of us had planned). Overall the day was a great one, and lots of fun celebrating in true Ugandan fashion! Marianne handing out the checks. They started their new cycle yesterday. So after all that hoopla they are starting again the next week. This year they are hoping to increase the amount of shares they can buy from 5 (25,000 shillings) to 10 (50,000 shillings). They are also increasing their group by three people, now up to 16. Other community members have shown interest but the group decided they would rather help start other groups then have them join theirs (how is that for sustainable)! We are sad we won’t be there for much of their next cycle, more out of selfish interest in their progress rather then necessity of our presence. They have done so well and no Mr. Potters have stopped this savings and loan from having a Merry Christmas! We're home for Christmas with family and friends! We flew in on Wednesday night and have been loving connecting with so many wonderful people in such a wonderful place! Right now we're catching up with family, friends, and the places we love in Minneapolis/Saint Paul, and we'll be in Sioux Falls starting on Christmas eve. It's strange and hard to be away from Uganda but so, so fabulous to be home! But, on to the real reason that I wanted to post - Camp GLOW (Girls Leading Our World!) I spent the first week in December at an incredible nation wide girls empowerment camp put on by Peace Corps Volunteers and counterparts and wanted to write about what an awesome week we had. If you remember last year, Ryan and I counseled at National Camp BUILD (Boys of Uganda in Leadership & Development). This year, I decided to work with the ladies. I was so glad that I did. It was a wonderful week full of fun, laughter, learning, and growing! I loved it! With Evelyne, Ronah, Jenipher, and Gloria - the BTPC Counselors! Eat em up! Eat em up! Each day of the week the camp had a different theme - GLOWing with self esteem, GLOWing with strong bodies, GLOWing with a bright future, etc. Each morning we met as a camper group to discuss the theme and the motto for the day, then went to different sessions related to the theme. Counselors and staff took turns leading the sessions - I taught all about family planning on Wednesday with a Ugandan counterpart from Kasese. Evelyne, one of the Bushenyi girls, taught the whole camp about making RUMPS with another PCV. The girls also had sessions on nutrition, communication, assertiveness, income generating activities, gender roles, malaria, HIV, and many more! Additionally, they were able to hear from a number of special guest speakers including the American Ambassador, PC staff, lecturers from Makerere University, and Ugandan female professionals. In the evenings we played capture the flag, watched movies, had a talent show, and had a dance. It was a jam packed week of tons of fun activities and many chances for learning and development as well. One of my favorite surprises from the week was getting to know all of the other Ugandan co-counselors and staff from all around the country. It inspired me to see so many incredible twenty-something Ugandan women in one place - my service just didn't put me in contact with that many inspiring Ugandan women who were my age. These women truly were leaders and I loved the opportunity to get to know them during the week. I also loved it that my four girls from Bushenyi got to meet them - I truly think that they are role models for these young women, and shining examples of how they too can be strong women and leaders of Uganda. My week at GLOW was so much fun. In some ways it was just like any other summer camp - crazy songs (The Hole Song and Boom Chicka Boom made a number of appearances), chatting before bed, homesickness, and energy. Then, there would be little things that reminded you that this was a camp in UGANDA! One of these things that was a constant reminder of this was that we held camp at a big primary school in Kisubi and stayed in the dorms. We slept in bunk beds 3 high! My dorm was one giant room with 95 campers and counselors in it. We bathed twice a day - cold bucket baths - and ad only a foot or two of space by our beds to keep our things, not even enough to stand facing the front between beds. That was an adjustment! Early on in the week, a girl rolled off the top bunk during the middle of the night in her sleep. It was awful - She badly hurt her arm and, as if that wasn't enough, had to battle guard dogs on the premises to get to a hospital (where nobody was available to do an X-ray until 9 am). Definitely not your typical summer camp issue! We also had cases of malaria and other not-so-typical summer camp sicknesses. And, in the last night, the before bed chatter was not what you'd typically expect - boys or clothes. The girls were talking about the tribal circumcision ceremonies in their region! Uganda for sure! All in all - it was a wonderful week. Some of my favorite things all rolled into one - the girls of Uganda and CAMP!!! Memories made during the week will not be easily forgotten - by me, by my co-counselors, and by the 160 amazing girls that took part in this fabulous week. Here's the blog that the GLOW media staff put out during the week. It gives a little more detailed picture of what each day held and lots of great pictures! Well done Liz! And, here's the link to some of my pics from the week on facebook. I was a bit too busy counseling to spend much time on taking pictures, but there are a few ones! Merry Christmas everyone! It's great to have already seen some of you, and we can't wait to see others soon! In Runyankore, “ninsiima” literally means “I am appreciating.” Today, I’m using it to say “I am thankful!” And I am! Happy thanksgiving everyone! We all have so much to be thankful for! We hope your thanksgiving season is full of wonderful times with family and friends, good conversations over delicious dinners,and not too much crazy shopping! We will greatly miss time with family and friends for yet another holiday - but this will be our last major holiday spent in Africa! Knowing that we will be home to visit in less than a month and spending Christmas together is a wonderful feeling! We can’t wait to see you all! I have so many things to be thankful for this year! I’m thankful for an extraordinary two years spent in such an incredible and beautiful place. I’m thankful for the students, coworkers, and neighbors that have truly become our family here in Uganda. I’m thankful for the family and friends at home who have believed in our dreams from the very beginning and supported us and loved us through the many ups and downs of the last two years. I’m thankful for a wonderful relationship with my husband and best friend, and the ways our time in Uganda has strengthened us and helped us grow closer as a couple. I’m thankful for the memories we have made with each other, our visitors from home, and some of our dearest PCV friends. I’m thankful for good health in a place where bizarre epidemics and tragedies are a way of life. And...I’m thankful to now be thinking now about the next adventure our life will hold! It was almost exactly two years ago that we were telling family and friends that we had received our Peace Corps invitation to Uganda! Although we’d originally expected placement in the Caribbean, right around thanksgiving, we got a call from our PC recruiter about a change of plans - sub-Saharan Africa! We were thankful that an invitation was on its way and thankful for the opportunity to embark on a wonderful, thrilling, and frightening adventure! Before we knew it, our invitations had arrived. I remember the craziness of getting ready to go, the sorrow of leaving the people, places, and work that we loved, and most importantly the way our family and friends encouraged us and supported us in the major transition we were going through! It’s surreal that two years have passed since that Thanksgiving! Some days it feels like we have been in Uganda for *such* a long time. Thinking about the last times we spent with family, friends, in our home, and at our jobs, feels like far more than two years ago. But, at the same time, it’s hard to believe we’re coming to the end. Days, weeks, and months truly have flown by. We’ve gotten lots done, but there has always been so much more to do. But - here we are! Two years down, and just a few months left. Although our original Close of Service (COS) date was expected to be in March or April, Ryan and I received word this morning that we would be granted an early COS on January 31! We’ll be home a bit earlier than planned! Our renters are moving out at the end of January, so we’ll be back in our *home* at the start of February! I’ve been offered a 7th grade teaching position in Saint Paul, and Ryan has some good leads on jobs too. We are so thankful that the pieces are coming together for our future. We are blessed beyond belief! We’re looking forward to wrapping up our life here, saying some heartbreaking good byes, and moving on to the wonderful things that await us in America. It will be bittersweet, but fabulous to be home! The two weeks before Christmas will hold a lot of exciting things too! Ryan will be here at the college, helping “invigilate” exams, packing and organizing (what a good man I have! ), and wrapping things up with students and staff. I’ll be spending just over a week helping to train the brand new group of education PCVs that arrived in country last week and then going off to counsel at National Camp GLOW (Girls Leading Our World). GLOW is a girls leadership and empowerment camp for 12-15 year olds from all over the country. I’m also bringing four of my girls club students as Ugandan counselors for the camp. I’m excited to get to counsel the girls who come to the camp, and help my young women grow into the fantastic counselors and leaders that they are! Then, back home for a weekend and to help our VSLA finish their amazing one year cycle. And then...home for Christmas!!! We really can’t wait to see you all! I wish you all the best in your thanksgiving celebrations. Thank you for reading our blog, supporting us, and encouraging us all along this journey! We could not be more thankful! Tusiima munonga! We are so very thankful! We love and miss you all! And...we’ll be SEEING you soon! First of all - new pictures! Check out the end of this album to see pics from Halloween and also some to go along with this post! Now, on to the good stuff...Yesterday Ryan and I, but mostly Ryan, took our cultural adventures in Uganda to a whole new level! We’d gone out to our trading center to do some shopping, and found a huge commotion at our stage. There was a large group of people, talking excitedly, grouped around a truck. As we got closer, we realized what it was - a truck full of grasshoppers! Fried grasshoppers are a common road snack in Uganda - and my dear Ryan does enjoy them - but we’d never seen them being sold (live) by the bagful! We started talking with a motorcycle (boda) driver friend of ours, Nelson, about the market happening in front of us, and...before we knew it...we’d spent 50 cents on a large plastic bag full of living, breathing, soon to be eaten grasshoppers! Seeing our bewilderment at what we had just done, Nelson pulled us away from the crowd to do a little one-on-one grasshopper instruction. He started by pulling a grasshopper out of the bag, still moving, and demonstrating how to remove its wings and legs in preparation for cooking. Then, before we knew it, he’d found two boys from the village and promised them each a bitano (20 cents!) if they would come to our house with us and remove all of the wings and legs from the bag full of grasshoppers! Done! So, we walked back to our house, trailed by two little boys and a big bag of insects. There’s currently a large tupperware full of grasshoppers in our pantry. Never thought I’d say that sentence! Since we’re a one grasshopper eater family, you’re all invited to make the trip to Uganda to take part! Me - I’ll stick to veggies and popcorn! If you stuck with me this far, you might be interested in a little live footage of the event! Not for the feeble stomached among us - I could barely stand it! But...for your viewing pleasure...The Food Channel, Uganda style! Bon Appetit! We love and miss you all! *For Daddio - ah, the good ol’ days! Did grasshoppers ever make it to the cabin or camp?